The territory for us is patrimony and common good. The cultivation of a region does not mean exploit it, but to preserve its vitality. Not only through the practice of sustainable agriculture, but concrete actions to safeguard a region that is a common patrimony and heritage. Michele Chiarlo has chosen an approach of integrated sustainability, care for the environment and the productive context which reverberates across each choice made by the winery for the purpose of safeguarding a landscape which is the basis of the quality of its own wines. We have put in place, and are implementing ethical actions and practices, to improve the sustainability of the whole supply chain and increase the sensitivity of the end consumer by taking care of the landscape as a common good. From management of the vineyards to the winery, from the attention given to the materials used to renewable energies, our objective is lightness: a sustainable Chiarlo Galaxy which can be monitored, where the environmental impact from the vine to the consumer table is gradually and continually reduced in favour of an ever more authentic expression and in balance with nature. VIVA is the project of sustainable wine culture made up of several of the most important wineries in Italy. Michele Chiarlo, beginning in 2011, was among the first companies to join when the programme was already in the pilot project stage. The goal of VIVA is to monitor and assess the entire production chain, its purpose to identify and develop tools for a low impact corporate model, not only in terms of agricultural practice, but in the context of global, regional and community production. Since the 2010 harvest, our Barolo Cerequio has been certified VIVA Sustainable Wine. From 2016, all Michele Chiarlo Grand Crus will be VIVA certified. To assess the sustainability of the winery, VIVA uses the indicators developed on the basis of international principles and standards. Evaluates the emission of CO2 across the life cycle of each product and the total climate changing emissions of the winery for the purpose of lowering the carbon footprint across the entire chain. The water footprint expresses the total volume of drinking water consumed by the winery in its totality and the impact on the hydrogeological cycle to combat waste and pollution. This indicator takes into consideration the agronomic management practices and their impact on the ecosystem. It also analyses the aspects linked with soil management and fertility, and the use of crop protection products. The indicator created to consider, when assessing sustainability, the landscape as the interaction between nature and man, evaluating, by means of qualitative and quantitative measurements the activities carried out by the companies and how they impact on the region. The objective measurement of the indicators allows the winery to undertake a measurable virtuous path and the consumer to monitor the environmental, ethical and socioeconomic progress. The transparency of the protocol is thanks to the biannual certification by a third party organisation and the application of a QR code on the label which is connected to the verification of the achieved results. The origin of Michele Chiarlo quality is the vineyard. To preserve its sustainability, our winery has developed agronomic practices aimed at safeguarding the biodiversity, soil fertility and the quality of the end product. Increasing biodiversity through the natural enhancement of the flora and natural microorganisms in the soil – grassing and green manure – for the improved immune defence of the vines. Reduce the weight of glass bottles to reduce the emission of CO2. The weight of the bottle does not impact on the quality of the wine, in any way, but does increase the environmental footprint of a winery considerably. Michele Chiarlo has decided to adopt lightweight glass, making it possible to optimise transportation, over long distances above all, and significantly reduces the emission of greenhouse gases. Recyclable and reusable, with low environmental impact, lightweight: cardboard ensures maximum protection of the product on a par with traditional wooden crates, but allows for a considerable savings on resources. More practical to handle and transport, Michele Chiarlo has chosen to use innovative packaging for wines, a sign of a new way of understanding and designing the viticultural chain. Starting in 2016, the productive frameworks of Michele Chiarlo have undergone a profound restyling in the key of green. The facade of the wineries have been covered by a green mantle to improve the energy performance of the building and lower the impact on the landscape. The vertical gardens clean and filter the air by means of photosynthesis, protecting the structures from the sun and rain, increasing the average life of the building and promoting the development of biodiversity. The new covering creates a natural filter between the exterior and interior which reduces energy costs and the overall emissions of the facilities. In our winery, innovation is right at home, not only in the vineyards. At Palás Cerequio, Michele Chiarlo has installed a free recharging station of the Tesla network, the American car manufacturer which, for years, has been involved in the production of an electrical and sustainable means of transportation. It is the first Tesla Destination Charging point in Langhe, Roero and Monferrato: with just a few hours charging time, it can provide hundreds of kilometres of autonomy. Also at Palás Cerequio, electric E-Bikes and pedal assisted bicycles are available for guests. Sustainability is beauty. 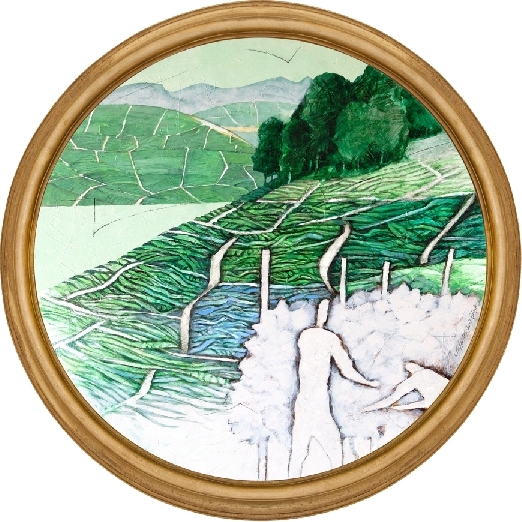 Michele Chiarlo has decided to improve his vineyards through actions aimed at reducing the interventions of man on the landscape. At our own expense, we have buried the electrical cables at the La Court estate, and replaced the cement poles with wood poles: an act of love and profound respect for the heart of our production of Barbera d’Asti. In all the other land parcels, a progressive abandonment of cement in favour of corten steel palisades is underway, reducing their visual impact and helping to protect the aesthetic horizon of the hills designated World Heritage Sites.